Principles of heat turbines and turbocompressors and their fundamentals design are described in the article 11. Turbomachine, and as key terms are one-stage steam turbine, multi-stage steam turbine, multi-casing steam turbine, multi-stage compressor, turbocharger and combustion turbine. Uses these types of heat machines is very wide and in the next chapters are described the most significant use of these machines. The steam turbines need many secondary equipments and a resource of a steam as a working fluid. In this case can be use any kind of fuels, because the resource of the steam can be with external heat transfer. The cost of the complete unit with the steam turbine is very expensive, and the size of this unit is larger than other types of machines (e.g. internal combustion engines-ICE), therefore the most common use of the steam turbines is as drive the electric generator in the thermal power plants or the combined heat and power plants (CHP plant), a drive of ships or other working machines with big power input. As working fluid of the steam turbines is the most frequently used water steam, but it can be use other vapors. Temperature of the admission steam of the steam turbine is usually about 535 °C (for case older type of the steam turbines), 565 °C (modern fossil-fuel unit) and for case supercritical steam turbine can be to 650 °C [7, p. 274] (as material of blades of first stages are made from a nickel alloy). The water steam is generated in steam boilers (as fuel is used fossil fuels, biomass, waste etc. ), in steam generators of a nuclear power plant or in steam generators of a solar power plant. For case geothermal power plant can be a resource of steam a geothermal hole. 1.454 Flowchart of a condensing turbine. 1 cooling loop of condenser at minimum condensing pressure; 2 cooling loop of condenser for case use of condensation heat (suppressed condensation). T steam turbine; Kon. condenser; Ch. cooling unit, used direct Air-Cooled method (as this case) or evaporative cooling; S.T. heat consumer (e.g. a heat power supply). This flowchart is typically for CHP plants. The loop number 2 is activated for case a requirement of the heat consumer (at heating-winter season). If there is not any requirement of the heat consumer then it is activated the loop number 1. In this case is minimum temperature condensation and maximum thermal efficiency of the steam cycle. The condenser is usually located just behind the turbine (outlet axial brachne of turbine) or under the turbine-the turbine must to lie on a concrete desk (the turbine has the side outlet). In case the air cooling condenser is the distance between the turbine and the condenser bigger (the air condensers are usually located on the roof of the machine room). 2.139 Flowchart of a back-pressure steam turbine. a steam piping. pi [Pa] the admission pressure; pe [Pa] back-pressure. The back-pressure is relation to a next use of the steam and this pressure can be higher than 1 MPa. The outlet steam can be fed other technologies or one can be used for the heating. 3.167 Types of the steam extraction of the steam turbine. left controlled extraction; right uncontrolled extraction. The controlled extraction are used for feed of a steam pipeline, where the pressure steam is higher than at the exit of the turbine (this steam is used for industry or for heating). The amount of the steam extraction is controlled by the valve see Figure 23 bellow. The uncontrolled extraction are used at the steam turbines in power plants for a regeneration of heat1. For case a multi-casing steam turbine can be the extraction between two casings. The regeneration of heat in steam cycle is a process that increasing the efficiency of the cycle. At the regeneration of heat is condensation heat of the extraction of steam used for preheating of a feed water of a boiler. The steam turbine with the controlled extraction is divided on two section. Both section are designed for the maximal flow mass rate through the extraction. It means that the mass flow rate through the turbine section behind the control valve is smaller than through first turbine section (in front of the control valve). If a consumer of the extraction steam is out of operation (season operation, service stop working and etc.) then the power output of turbine is reduced (approximately about 50% to 60 % of nominal power output of the turboset). There are steam turbines for the same mass flow rate in front of and behind the extraction but these turbines are expensive and if the consumer of extraction steam operates during full year this construction of the turbine is not need. 4.150 The flowchart of a CHP plant with a steam turbine. This plant contains one back-pressure steam turbine with controlled steam extraction for an industrial use. 1 depot of fuel; 2 steam boiler; 3 condensing turbine with one controlled extraction; 4 condenser; 5 parallel cooling loop, in this case with cooling tower; 6 feeder of heating loop and the return from heating loop; 7 circulation pump of cooling loop; 8 reducing pressure unit of bypass steam to condenser; 9 cooling unit; 10 consumers of steam; 11 pump for a return condensate; 12 reducing pressure unit of bypass steam; 13 condensate pump; 14 reducing pressure unit for heating of feedwater storage tank and thermal degassing; 15 feedwater storage tank; 16 chemical treatment of water and thermal degassing; 17 heater of refilling water; 18 reducing pressure unit of steam for heating of refilling water; 19 feed pump. This flowchart is used for steam turbines in CHP plants about power output ~10 až 70 MWe. The power output of CHP plant with the steam turbine corresponds with the connected of heat and steam consumers therefore their power output usually are to 100 MWe. The CHP plants are usually built in near the heat and steam consumers a often they are constituent part of an industry complex that has great consumption of heat and steam. The power plants are usually built near source of a fuel or for other operation reasons near source of water (river, reservoir..), high voltage wires etc. 5.146 The flowchart for 200 MW Škoda thermal power plant. 1 depot of fuel; 2 steam boiler; 3 superheater; 4 reheater2; 5 high-pressure (HP) casing of turbine; 6 intermediate-pressure (IP) casing of turbine; 7 low-pressure casing of turbine; 8 condenser; 9 system of low-pressure (LP) feedwater heater (FWH); 10 cooler of steam for spray deaerator; 11 feed water tank; 12 feed pump3; 13 condenser of turbine for feed pump; 14 system of high-pressure FWH; 15 cooling system of the generator and exciter (generator is cooled by hydrogen); 16 transfer of heat from cooling system of generator and exciter; 17 condensate pump. The reheating of steam is other method which is used an increase efficiency of R-C cycle. The steam at the exit of the HP turbine casing is transfered again to the boiler (to the reheater), where it is heated almost on the admission temperature, but at lower pressure. As a drive of feed pump is usually used an electric engine (so called electrically driven feed pump) for smaller unit or a small steam turbine (so called turbo-feed pump) for larger unit. The power input of the feed pump is small, therefore the steam turbine for drive of this pump has lower efficiency than the main steam turbine. If the turbo-feed pump efficiency is lower than product of efficiency of production electricity of the main turboset and efficiency of the electrically driven feed pump, then is taken into consideration of use the electrically driven feed pump. 6.168 A arrangement of turboset 4x200 MW in machine room of the Dětmarovice thermal power plant. Figure: . 7.149 A flowchart for 1000 MW nuclear power plant. a primary circuit; b secondary circuit. 1 nuclear reactor; 2 circulation pump; 3 steam generators; 4 high-pressure casing of turbine; 5 3x low-pressure casing of turbine; 6 water trap4; 7 reheating of steam–reheater; 8 high-pressure feedwater heater; 9 feed water tank with deaerator; 10 feed water pump of steam generator; 11 system of heater for heating of water5; 12-13 system of low-pressure feedwater heater; 14 3x condenser of turbine; 15 condensation pump; 16 condenser of turbine for feed pump, and first stage of heater for heating water. The steam flow on the exit of HP casing contains some amount of water drops, because the steam is expanded from saturation state to wet steam state. These drops is necessary separated from steam flow inside the water trap–the reheater is not constructed for evaporation of water drop and the drops inside steam flow could cause a damage of the blades inside LW casing. Although this is a power plant is possible some heat use for heating (e.g. heating of the power plant grounds or near housing estates). 8.989 A turboset with a steam turbine and its accessories on a base frame-mounted design. The designation of this package unit is SST 100. Parameters: power output up to 8,5 MW; maximum inlet pressure of steam is 6,5 MPa; maximum inlet temperature 480 °C; size 8x3,7 m at height 3,4 m. Manufacturer: Siemens AG. Reference . The steam turbine are also used as drive of ships and the first installation of steam turbine to ship Turbinia at end 19th was an impulse for bigger interest about the steam turbines. The production of steam for steam turbine on ship have been performed through a steam boiler on solid or liquid fuels. For production of steam can be nuclear reactors also that are designed for the ship applications. The nuclear propulsion increases a operating range these ships, e.g. at aircraft carrier up to 350 000 km. The power output of the steam turbines are in relation to function and displacement of the ship, e.g. Nimitz class of the aircraft carriers contains 4x steam turbine with 209 MW power output. 9.152 A nuclear icebreaker Yamal and simple schemes of connection a steam turbine on ships with nuclear propulsion . (a) scheme of icebreaker Yamal; (b) scheme of the Nimitz class aircraft carriers , [20, page 348]; (c) icebreaker Yamal . 1 steam supply from steam generator; 2 bypass of steam turbine for quick stop of screw propellers; 3 condenser; 4 3x one-phase generator AC electric current; 5 rectifier; 6 DC motor; 7 electric energy from second turboset; 8 screw propeller; 9 turboset with electric generator; 10 steam turbine for direct drive of screw propeller; 11 accumulation of electric energy through storage battery. Inside icebreaker Yamal are two reactors OK – 900 with 171 MWt power output on unit. These reactors produces steam water for two turboset with steam turbines. Total power of turboset is 55,3 MW. The electric energy is also used for consumption of icebreaker and for pump of water ballast. Length of icebreaker Yamal is 150 m, width 30 m, height 55 m, displacement 23 455 t, maximum speed 22 knots (44 km·h-1). 10.669 A gas turbine with combustion chambers (combustion turbine) and its accessories on a base frame-mounted design. 1 base frame-mounted with oil tank; 2 air inlet; 3 gas exhaust; 4 power output on shaft; 5 revolution counter; 6 oil pump. The combustion turbines up to 10-12 m their length are mounted on a base frame, in case smaller turbines the base frame can contain a generator. This figure shows Siemens SGT – 750 internal combustion gas turbine, power output 37 MW, heat efficiency 40%, compression ratio 23,8, gas exhaust temperature 462 °C, mass flow rate of gas exhaust 113,3 kg·s-1, 3050 to 6405 min-1, 8x combustion chamber. Picture of Siemens SGT – 750 from . 11.169 The combustion turbine are able to work in extreme surrounding conditions. 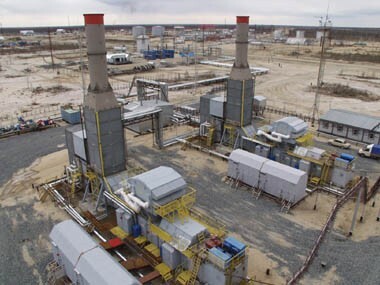 This is a power plant in Severo-Gubinsky oil field (Russia-Jamal peninsula). Power output 2x4 MW. Natural gas as fuel. This power plant consist only of combustion turbine inside a container with regulation, air filter, connections and a chimney. Figure from . 12.154 Flowcharts units with the combustion turbine with regeneration of heat and with a heat exchanger for heating. left flowchart with heat exchanger exhaust gas/air for regeneration of heat; right flowchart with heat exchanger exhaust gas/water for heating (power and heat plant with combustion turbine). m•vz [kg·s-1] mass flow rate of air; m•pal [kg·s-1] mass flow rate of fuel. a heat exchanger for regeneration of heat; b air for direct contact with hot exhaust gas; c heat exchanger exhaust gas/water. The temperature of hot exhaust gas can be to up 600 °C. These hot exhaust gas are mixed with cold air for purpose a decrease of exhaust gas temperature in front of the heat exchanger, concurrently is increased volume flow of the mixture (a mixture part is not necessary if there is a regeneration heat exchanger, because the temperature is decreasing inside its). 13.161 Single-line diagram of a small combustion turbine Capstone C30. 1 high-frequency generator; 2 inverter (50/60 Hz); 3 power supply of accessories of unit; 4 starter unit. The combustion turbine is composed of one-stage compressor and one-stage turbine with radial stages. The power output of the unit is 30 kWe, max. electric efficiency to 26 % (the best of efficiency in micro-turbines category), emission of NOx is 9 ppm, temperature of exhaust gas in front of the heat exchanger is 275 °C, weight of the unit is 405 kg, total height of the unit is 1,5 m. Resource of figure . A disadvantage of the micro-turbines is their very higher operating speed (20 000 to 150 000 min-1). It has high requirements on bearings of the generator and relatively high financial requirements on the inverter and the rectifier. However the units with micro-turbine are relatively expensive and consumes only the noble fuels, therefore are used most frequently as backup powers, which are able quick start. Concurrently they are lighter than the backup units with piston combustion engines and therefore they are better for manipulations. The small units be can to assemble in groups that contain common a control system, it optimizes their operating properties. Expansion gas turbines (the turboset does not contain any compression section) are usually called as turbo-expanders. It are frequently one stage turbines with one radial stage with axial exhaust especially if there is a requirement on wide scope of volume flow rate of the working gas and small enthalpy changes (the radial stages are less sensitive to change of the volume flow rate). For case higher working gas temperature are more suitable the turbo-expanders with axial stages (the axial stage is possible better cooling). The turbo-expanders are use as a reducing pressure unit on a pipeline, in the industry for liquefaction of gases and mix of gases with follow-up an extraction their component , in cryogenic industry (at the exit expansion of helium inside turboexpander can be only several tens of Kelvin , ). The power output of the turbo-expanders are about 100 kW to several megawatts. 14.666 Flowchart of a turboset with an combustion turbine and a turbocompressor for the compressor station Werne (Germany). 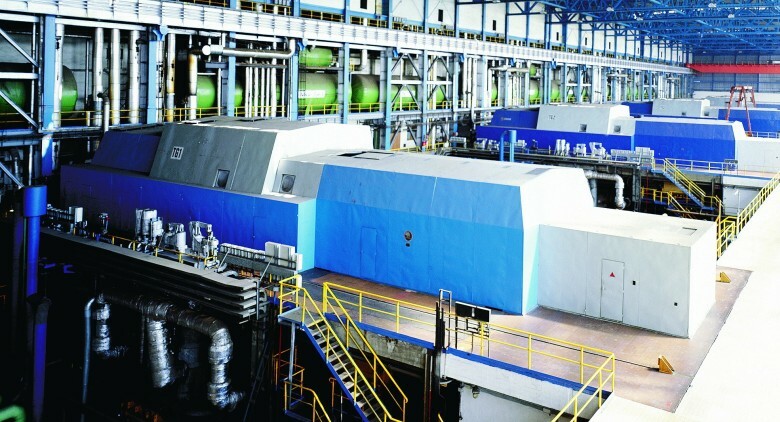 1 high-pressure turbine; 2 low-pressure turbine; 3 compressor; 4 pipeline; 5 wall that separates compressor section (natural gas section) from machine room of combustion turbine. The turboset contains two-shaft combustion turbine Pratt&Whitney FT8-55 about power output 26 MW. Other information about this compressor station is shown below. Information source . 15.720 A flowchart of accumulation power plant AA-CAES type. Z.V. storage tank of compressed air; Z.K. storage tank of cold accumulation liquid (oil); R.T. storage tank of hot accumulation liquid (regenerated heat). The compressed air is cooled by a coolant after its compression. The coolant is being pumped from tank Z.K. to thermally isolated tank R.T. The compressed air is being heated by the hot coolant in front of the inlet to the turbine. The hot coolant is being pumped from R.T. tank to the tank Z.K. 16.164 A turbo-fan jet engine. (a) simple view section of turbo-fan jet engine; (b) i-s diagram of changes of state of working gas inside the engine; (c) turbo – fan GE90 (reference ). i [J·kg-1] specific enthalpy of working gas; s [J·kg-1·K-1] specific entropy of working gas; aK [J·kg-1] specific work of compression; aT [J·kg-1] specific work of expansion; c [m·s-1] velocity of exhaust gas at exit of nozzle; psk [Pa] pressure inside combustion chambers; pat [Pa] pressure of inlet air. 1 stream of air; 2 first stage of turbocompressor; 3 fan nozzle (bypass); 4 other stage of turbocompressor; 5 combustion chamber; 6 stages of turbines; 7 directing flow of exhaust gas to exit nozzle; 8 fan air. The pressure ratio inside turbocompressor is up to 40, pressure ratio of air flow throught the bypass is only up to 10. 17.176 Main types of jet engines and the definitions their efficiency. (a) turbojet; (b) turbofan; (c) turboprop (propeller and engine are connected through gear). T [N] thrust of engine; v [m·s-1] axial velocity of engine in relation to the frame of reference (velocity in relation to stationary observer); ci [m·s-1] absolute velocity (in relation to the frame of reference) of working fluids at inlet of engine, subscript pal refers fuel, vz air (for combustion), b air (bypass); ce [m·s-1] absolute velocity of working fluids at exit of engine, subscript s refers exhaust gas; w [m·s-1] relative velocity (w=c-v); m• [kg·s-1] mass flow rate; ηi [-] efficiency of jet engine; Qr [J·kg-1] heat of combustion of fuel; ηp [-] propulsion efficiency of jet engine (max 1); the letter K terms control volume of engine. For the derivation of these equations was applied the Euler equation on the control volume. The effect of pressure forces on input and exit of the control volume are neutral, because they are the same. This equation is derived for case where the flight direction is parallel with flow of the working fluid (v // c). The influence the weight forces is negligible. The most higher propulsion efficiency is reached by cca Ma~0,4 for case turboprop, Ma~0,75 for case turbofan and Ma~1,7 for case turbojet (Ma Mach number). Definitions of jet engine efficiency and propulsion efficiency are shown in [14, p. 538]. 18.664 A flowchart of a two-shaft jet engine. NK low pressure compressor (LPC); VK high pressure compressor (HPC); VT high pressure turbine (HPT); NT low pressure turbine (LPT). The multi-shaft design of the jet engine is used for a regulation of the pressure ratio at change the operation conditions of flight through different rotation speed of high pressure compressor and low pressure compressor. A direction of rotation of shafts are same. Other information about regulation power of compressor are shown in chapter 26. Regulation of turbocompressors. The power and other parameters of jet engine are in relation to requiring airspeed of an airplane and its operating altitude. In currently the jet engine turbofan Trent 900 Rolls-Royce has highest from all thrust about 360 kN, this engine is used even on Airbus A380. The Concorde had used 4xjet engine turbojet Olympus 593 Mrk610, the thrust of this engine was about up 170 kN and at 2 Ma (maximum speed) about 45 kN (producer Rolls-Royce/SNECMA). The jet engine of Global flyer6 (Williams international, typ fj44-1) can be an example of small engine, this engine has 6,7 to 8,5 kN of the thrust. The jet engine of Marabu7 airplane (PBS Velká Bíteš) is an example micro engine TJ100 with 1 kN of the thrust. The first aircraft with the jet engine, that flew around the World without refueled. This event has become in the spring of 2005. The pilot Steve Fosset  also became the first man to circumnavigate the world in the aircraft itself. The Marabu is an experimental aircraft, that had developed by Brno university of technology . This aircraft contains combined propulsion system, that contents combustion engine with a pusher propeller and small jet engine - the engine is fitted to the frame on left side of the aircraft. The weight of jet engine is 19 kg . For propulsion of helicopters through the combustion turbine is used similar principle as for turboprop. In this case the combustion turbine drives a main rotor and a tail rotor through a gearbox. For held stability be can use a flow of the air by nozzles, that are fed from turbocompressor section of the combustion turbine. The power output of the helicopter turbines is approximately 100 kW up 800 kW and one helicopter can contain even several engines. The combustion turbine for aircraft are under strong and regular controls also they have limited service life due to strict legislation. This service life is very short time in relation to technical service life. Therefore these turbines are in good condition after exclusion from airplane and therefore they are use usually in power industry yet. These jet engines must be modified for stationary operation and production of mechanical energy (problem high shaft speed, removed of the bypasses, addition others turbines stages and turbocompressors stages etc. ), such turbines are called Aeroderivatives. The aeroderivatives reach up 40 MW power output (for cases radically modified aeroderivatives with high efficiency even over 100 MW). Advantages of the aeroderivatives is quick the start (thanks to lightweight their rotors) and lower cost for case small power output. The aeroderivatives with higher power output can be more expensive but one have higher efficiency8. The efficiency is increased through methods that are shown in article 27. Gas turbine in technological unit. These changes contains inter alia addition of others casings (with compressor and turbine stages), which increases the cost of the aeroderivatives. 19.665 Flowchart of simple aeroderivative. a core of the aeroderivative (combustion turbine from jet engine); b expansion turbine for use of an gradient of enthalpy which is equal to the kinetic energy of exhaust gas from core of the aeroderivative. The combustion turbine for the airplane do not contain horizontal assembly surfaces (need weight savings) and a montage is done in axial direction through vertical assembly surfaces. In these cases is needed special assembly tools for the montage and removal which are usually used at the maintenances of the airplane. 20.165 Examples of drives with combustion turbine for ships and personals cars. (a) turboset LM2500 with combustion turbine from GE company which is used on ocean liner Queen Mary II9, picture from ; (b) chart flow of turbine drive of personal car Chrysler (1963)10. 1 regulating nozzle; 2 drive of accessories of turbine drive (injection pump, drive of regeneration exchanger...); 3 drive of drive axle; 4 rotating regeneration exchanger (heat transfer surface of regenerator is made up from ceramic which has higher endurance on big change of temperature). The Queen Mary II is longest transatlantic ocean liner on the world about 345 m length and its displacement is 75000 tonnes. Its drive system contains a combination of ICEs and two units LM2500 which produce electric energy for electric drive screw propellers. The set screw propellers-electric motor are located inside a nacelle that is outside of the hull. The total of power output of the ship drives is 117,2 MW of which 50 MW produce LM2500 units. The unit LM2500 is formed by an aeroderivative from GE CF6 – 6 jet engine about 234 kN thrust (this jet engine is also used on an airplane Boeing 747). The turbine and the generator are mounted to especial box which is soundproof and is equipped antivibrating blocks. The flow channels of turbine are made of material which is resistant on surroundings of the sea air. The units LM2500 are located on the upper deck near a suction an chimney. The heavier ICEs are located under center of gravity of the ship inside of the hull. The turboset is two-shaft and is composed from the combustion turbine with one-radial stage of compressor and one-axial turbine and a drive tubine with one axial stage (the drive turbine section has opposite rotation than combustion turbine). The regulation of the power output is performed by a change of flow mass rate of the exhaust through the regulation nozzle. The regeneration exchanger rotates through high-pressure volume of compressed air even low-pressure volume of the exhaust. The nominal power output on the shaft is 130 hp at the rotation speed 3 600 rpm, the maximum rotation speed are 44 500 rpm. More information about turbine drives of the personal cars are shown e.g. in , . A gas turbine is also a component of a rocket engine liquid propellant. In these cases the turbine drives a oxidizer pump and a fuel pump through which is held required pressure inside combustion chamber (e.g. the operating pressure of the combustion chamber of SSME rocket engine of spacecraft Space shuttle has been 20,3 MPa and power output of turbine of hydrogen pump has been up 56 MW [25, p. 25], ). The exhaust heat at the exit of the combustion turbine is can used for production of water steam, similar as for production of heat water on the Figure 12. This steam can be used inside a steam cycle. The combination Brayton and steam cycle is called Combined cycle gas turbine (CCGT) and it significantly increases efficiency of transformation energy of fuel to electric energy on level upper 55 % (in currently /2012/ 60 %). 21.155 A flowchart of the combined cycle gas turbine and its illustration in T-s diagram. B flowchart of Brayton cycle; R-C flowchart of Rankine-Clausius cycle. The steam in steam boiler (heat recovery boiler) K is produced by heat from hot gas exhaust from combustion turbine. Through this way is cooled the gas exhaust. For higher efficiency of steam part of the cycle is can used regeneration of heat. T [K] absolute temperature. The entropy is relation to 1 kg of working gas in Brayton cycle. At combustion of the same amount of fuel inside CCGT is produced more work than is work of separate the combustion turbine. For higher power output of CCGT power plant be can used combustion other fuel in the steam boiler where is used oxygen in exhaust gas of the combustion turbine (so called additional heating). The additional heating decreasing the efficiency, because it is decreased portion of power output of the combustion turbine on power output of CCGT. A optimal calculation of the steam part of CCGT is derived from mass flow rate of the exhaust gas at the exit the combustion turbine and their temperature T4. From this description is evident that the maximum steam temperature Tb must be lower than the temperature of exhaust gas T4 about a difference ΔT1 (this temperature gradient inside heat exchanger is necessary requirement - superheater of the heat recovery boiler). The temperature of saturation of steam Tb' is given the necessary temperature difference ΔT2 inside an evaporator of the boiler. From law of conservation of energy is evident that heat which corresponding to temperature change of exhaust gas between temperature T4 and temperature T5' is equal heat which correspond to enthalpy change of steam between states b and b'. Heat which is correspond to temperature change of exhaust gas between temperature T5' and temperature T5 is equal heat which correspond to enthalpy change of water between states b' and a (if the steam cycle contains a regeneration heat then is consumption of heat lower between these temperatures). The minimum temperature difference between exhaust gas and feed water of the boiler is ΔT3. The result of the optimal calculation is the steam cycle about maximum possible power output. For maximum power output is usually used multi-pressure steam cycle, which is described in chapter 25. Steam turbine inside CCGT unit. 22.157 Flowchart of steam part of CCGT power plant Red mill. 1 input of hot exhaust gas from combustion turbine to steam recovery boiler; 2 exhaust of boiler to a chimney; 3 heat exchanger exhaust gas/hot water; 4 natural gas water boiler; 5 consumer of steam (0,9 MPa, 200 °C); 6 consumer of hot water (130/70 °C); 7 accumulator of hot water, non-pressure storage tank (5600 m3); 8 drum of boiler high-pressure circuit; 9 drum of boiler low-pressure circuit; 10 mixing of steam with condensate and preheat of feed water of boiler. 23.670 Back-pressure double-pressure steam turbine with one controlled extraction and one uncontrolled extraction, type G40 (ALSTOM Power in Brno). Power output 24 MW, speed 6000 RPM. The turbine does not contain regulation valve at its intput-power output of the turbine is regulated through regulation of steam pressure on a boiler. CCGT plant are worldwide thanks to their high efficiency and their short building time. CCGT units are also used as a drive of ships11. In these cases, the steam part is pasted behind the head drive unit, which is ICE or a combustion turbine. An efficiency these combined units can be up 51,5 % [1, p. 32]. For these purposes are most useful turbosets with steam turbine on a base frame, which contains a condenser also. 24.160 Compression station in Werne (Germany). (a) view on compression station; (b) machine room of compressors. The compression station Werne is located on transit pipeline of natural gas with pressure 7,5 MPa. It contains two two-stage compressors RV090 with the radial stages which are powered by combustion turbines. The inlet pressure is 6 MPa, pressure ratio is 1,45 (design pressure is 11,6 MPa), rotation speed are 5 500 min-1, capacity of station is 2x2 000 000 m3·h-1, nominal power output of compressors is 2x25 MW. The drive combustion turbines are two-shaft combustion turbines Pratt&Whitney FT8-55 about power output 26 MW (flowchart is shown on Figure 14). On base information and the pictures in . Similar types compressors as in transit stations are also used in industry to ensure circulation of a working gas on a technological unit. Therefore these types compressors with high pressure at the inlet and small pressure ratio are called circulation compressors [26, p. 16]. 25.671 Principle compression with intercooling and an axial section view of 6-stages radial compressor with one extraction for intercooling. (a) figure shows principle intercooling of two-stages radial compressor; (b) 6-stages radial compressor from GE type 2MCL, which contains one extraction between third and fourth stage for intercooling or an extraction compressed gas, figure from . mCh intercooler of working gas; i state of working gas at inlet; e state of working gas at exit; e* state of working gas at exit for case compression without intercooling; 1 extraction of working gas to intercooler; 2 flow of cooled working gas from intercooler back to compressor; aiz [J·kg-1] internal work at isentropic compression from state i to state e*; ai [J·kg-1] internal work of compression at the intercooling from state i to state e; Δai [J·kg-1] internal work of compressor which is saved by intercooling (Δai=aiz-ai). The intercooler can be so installed between individual casing for case multi-casing compressors. It is evident that maximum work Δai is reached at isothermal compression. Therefore the intercooler are usually used behind the greatest number of stages, but are used other ways cooling of compressors. There are reversible compressors which are special type used in gasholder units. This type compressor can be able to operate as a compressor and a turbo-expander. 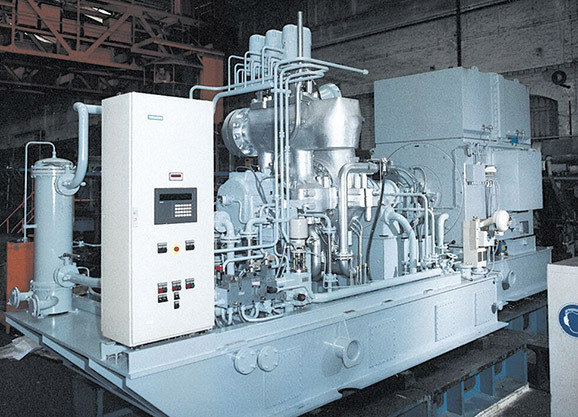 The reversible compressors are connected through a coupling with electrodrive which be able to worked as an electric generator . 26.163 Flowchart the set of ICE with gaseous fuel and a turbocharger. 1 piston combustion engine; 2 cooler of fuel mix; 3 inlet of air; 4 natural gas (a fuel); 5 turbine section of turbocharger; 6 compressor of turbocharger; 7 spark plug; 8 catalyst; 9 mixer; 10 cooling loop of engine. The capacity of turbochargers is from 500 m3·h-1 of air (ICEs about 100 kW power output), up 20 000 m3·h-1 of air (stationary ICE between 5 up 7 MW power output), for piston combustion engine as marine propulsion can be use turbocharger with more capacity. More information about the turbochargers and their regulation is shown in . 27.682 Blades with cooling channels of an combustion turbine MS5002 GE. The cooling air is extracted in some part of compressor (for first stages of expansion part of the turbine is extracted cooling air behind last stage of compressor). The cooling air is flowed to the stream of expanding exhaust gas through holes at end of pressure side of the blade. The surface of blades must be coated by corrosion resistance layer on its cooling side. Figure from . The construction of the combustion chambers must be cooled also. It is realised by combustion air which flows through the construction. Ecomagination, 2012. Webové stránky společnosti General Electric Company zaměřené na prezentaci produktů. Web: http://www.ecomagination.com. DANILOV, Alexandr. Пpocтopы apктики, В мире науки, 2006. Ruskojazyčná verze časopisu Scientific American. Moskva: Адрес: 119991 г. Москва, ГСП-1, Ленинские горы, МГУ, д. 1, стр. 46, офис 138. This document is English version of the original in Czech language: ŠKORPÍK, Jiří. Tepelné turbíny a turbokompresory, Transformační technologie, 2011-02, [last updated 2014-02]. Brno: Jiří Škorpík, [on-line] pokračující zdroj, ISSN 1804-8293. Dostupné z http://www.transformacni-technologie.cz/23.html. English version: Heat turbines and turbocompressors. Web: http://www.transformacni-technologie.cz/en_23.html.